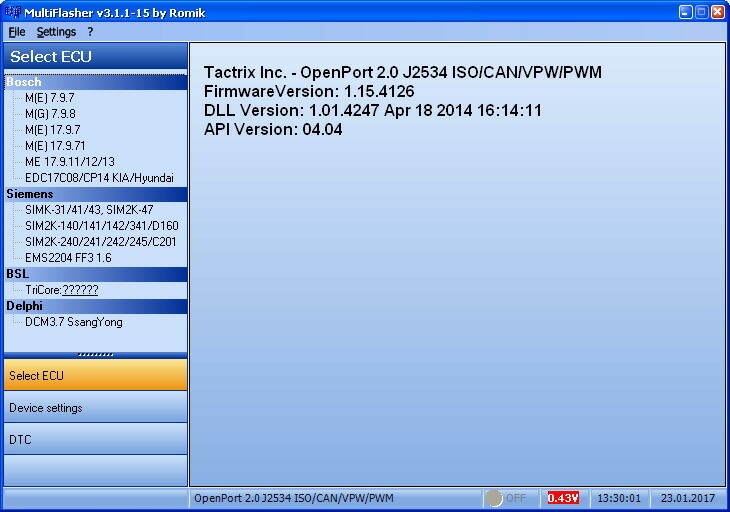 Multiflasher Ecu programmer for Hyundai kia via OBD is a combination of one Tactrix Openport 2.0 plus one USB dongle plus (or the software is compatible with other J2534 device. 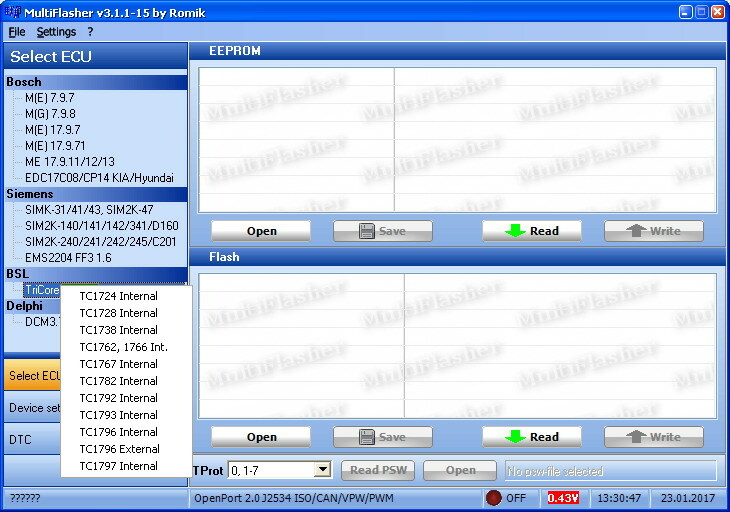 Multiflasher can read ECU data, write ECU data and do calibration, it plays an important role in the power upgrade. Before flashing and after reading the program checks the firmware and checksums, and corrects them if needed. It allows to avoid flashing incorrect dumps or to make sure that reading is correct. It contains a function of errors reading, decoding and reset with a possibility to manually add and edit their description. Bosch M(G)7.9.8. Only FLASH memory writing through the OBDII. Vehicles: KIA/Hyundai i10, i20, i30, Accent (Verna), Elantra, Pikanto, Rio, Ceed, Cerato, Soul, etc with 1.4L, 1.6L engines and a mechanical accelerator pedal. Siemens SIMK-31/41/43, SIM2K-47. FLASH memory reading and writing through the OBDII. Vehicles: KIA/Hyundai Coupe, Elantra, SantaFe, Sonata, Tiburon, Tucson, Ceed, Cerato, Sportage, etc with 2.0L and 2.7L engines. The set of modules: Siemens SIM2K-140/141/142/341/D160. FLASH memory reading through ECU connector and flashing through the OBDII. Vehicles: KIA/Hyundai Carens, Cerato new, Magentis, Sonata, Sorento, Sportage new, ix35, etc with 2.0L and 2.4L engines, and Chevrolet Epica with 2.0L and 2.5L engines. Siemens SIM2K-241/242/245/С201. Reading and flashing through the OBDII diagnostic link connector. Supports GDS format. Vehicles: Elantra MD 1.8, Sonata new, i40 2.0, ix35 new, Ceed new, Cerato new, Optima new, etc., SsangYong Actyon 2.0, Korando. BSL TriCore. Reading and flashing of ECU internal and external FLASH/EEPROM memory with Infineon TriCore TC1724, TC1728, TC1738, TC1762, TC1766, TC1767, TC1782, TC1792, TC1793, TC1796, TC1797 processors in BSL mode. The approximate short list of supported ECUs BOSCH M(E)17.9.7 (VAZ/UAZ), and ME17, ME (D, G)17, EDC17 (AMG, Audi, BMW, Citroen, Honda, Hyundai, KIA, Land Rover, Mercedes, Mini, Peugeot, Porsche, Renault, Saab, Skoda, Toyota, Volkswagen, Volvo). – protection disabling in BOSCH M(E)17.9.71 VAZ/UAZ. Bosch M(E) 7.9.7(+). Only FLASH memory writing of M7.9.7, M7.9.7+ and ME7.9.7 controllers installed in Korean and Chinese vehicles through the OBDII, and in Russian vehicles through the ECU connector. Supports SMS-Software compressed format. ME7.9.71 support will be available soon. Siemens EMS2204. Only writing FLASH memory writing with factory and tuned files through the OBDII. Supports VBF format. For Ford Focus III with a 1.6L engine. Delphi DCM 3.7 SsangYong. FLASH memory reading and writing through the OBDII, all checksums verification, checksum verification and correction for maps area. Before flashing and after reading the program checks the firmware and checksums structure, and recalculates them if needed. It allows to avoid flashing incorrect dumps or to make sure that reading is correct. It contains a function of errors reading, decoding and reset with a possibility to manually add and edit their description. All the modules function through OpenPort 2.0 or any other J2534 device, including K-line protocol. There is no need for additional adapters. Only FLASH memory flashing through the OBDII diagnostic link connector. FLASH memory reading and flashing through the OBDII diagnostic link connector. Siemens SIM2K-140/141/142/341/D160. FLASH memory reading through ECU connector and flashing through the OBDII diagnostic link connector. Vehicles: KIA/Hyundai Carens, Cerato new, Magentis, Sonata, Sorento, Sportage new, ix35, etc with 2.0L and 2.4L engines, and Chevrolet Epica with 2.0L and 2.5L engines. Siemens SIM2K-241/242/245/С201. Reading and flashing through the OBDII diagnostic link connector. Supports GDS format. Vehicles: Elantra MD 1.8, Sonata new, i40 2.0, ix35 new, Ceed new, Cerato new, Optima new, etc., SsangYong Actyon 2.0, Korando. Reading and flashing of ECU internal and external FLASH/EEPROM memory with Infineon TriCore TC1724, TC1728, TC1738, TC1762, TC1766, TC1767, TC1782, TC1792, TC1793, TC1796, TC1797 processors in BSL mode. The approximate short list of supported ECUs BOSCH M(E)17.9.7 (VAZ/UAZ), and ME17, ME (D, G)17, EDC17 (AMG, Audi, BMW, Citroen, Honda, Hyundai, KIA, Land Rover, Mercedes, Mini, Peugeot, Porsche, Renault, Saab, Skoda, Toyota, Volkswagen, Volvo). Special features of the module: – verification/recalculation of checksums and BOSCH digital signature, Siemens/Continental SIM2K 240-245 checksums verification/recalculation; – protection passwords reading for BOSCH TPROT 8-10 VAG, TPROT 11-13 KIA/Hyundai, TPROT 12 M(E)17.9.71 VAZ/UAZ, GPT (a special adapter is required) and Siemens/Continental SID208 Ford, EMS2204 Ford, SIM2K-24x KIA/Hyundai/SsangYong/Chevrolet; – import of BOSCH and Siemens/Continental SIM2K 240-245 maps; – protection disabling in BOSCH M(E)17.9.71 VAZ/UAZ. Bosch M(E)17.9.7 OBD. Only VAZ/UAZ FLASH memory flashing through the OBDII diagnostic link connector. Special features: IMMO OFF without opening the ECU. Only for ME17.9.7 VAZ!!! Bosch M(E)17.9.71 VAZ/UAZ OBD. Only VAZ/UAZ FLASH memory flashing through the OBDII diagnostic link connector. Factory files can be written without any limitations, tuned ones – only to the prepared ECUs (in the BSL mode). Another special feature: defining the ECU protection state. Only FLASH memory flashing through the OBDII diagnostic link connector. For factory and tuned files! Only flashing of tuned and factory files through the OBDII diagnostic link connector. Supports VBF format. For Ford Focus III with a 1.6L engine. Firmware reading and flashing through the OBDII diagnostic link connector, all dumps checksums verification, maps checksums recalculation.